Isolated Fallopian tube torsion is an extremely rare condition in pregnancy. There are less than 50 cases published. Risk factors include mechanical, anatomical, physiological, and pathologic conditions. Specificity of this condition is that more than 90% develop on the right side. 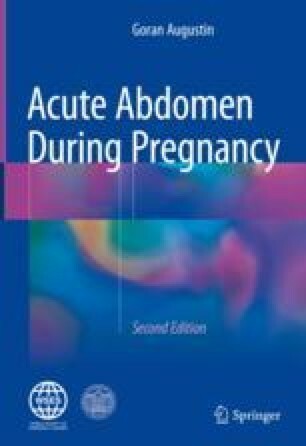 Clinical presentation is the same as for adnexal torsion, and sometimes even with abdominal ultrasound, the preoperative distinction between adnexal and Fallopian tube torsion is not possible. Differential diagnosis is wide, as for adnexal torsion. As the condition appears predominantly on the right side, it is commonly misdiagnosed as an acute appendicitis. Suspicion of Fallopian tube torsion is an indication for operative intervention. Laparoscopy is the abdominal entry of choice. Detorsion is the procedure of choice even when ischemic changes are present. If vitality is not restored after detorsion, resection is indicated.